First take out a nice 2-quart saucepan. In it combine the sugar, cocoa, milk and margarine. Cook and stir the mixture over medium heat until the margarine melts, and the sugar dissolves. Bring the pot to a boil, and reduce the heat slightly. Simmer the mixture for several minutes, until the chocolate forms a soft ball when dropped into a bowl of cold water. This is about 234° on a candy thermometer. Remove the pan from the heat when it reaches the soft ball stage. Add the salt, peanut butter and vanilla. Stir until the peanut butter is dissolved. Finally stir in the oatmeal. The mixture may seem a little runny, but will thicken up as it cools. Drop the mixture from a tablespoon onto a sheet of waxed paper. It should form medium sized cookies. Depending on the size of the cookie, you may end up with as few as 15 or as many as 24. This is my favorite recipe in the whole wide world. It got it’s name because it could be prepared quickly when a housewife looked out her window and saw the preacher riding up the mountain on his horse. 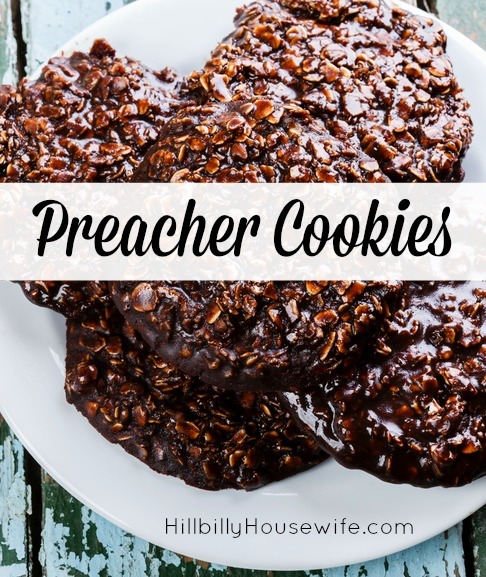 By the time the preacher arrived, the cookies were cooling. I remember family members making them for me as a kid, and I still have people calling me just to request this recipe over the phone. This one recipe could make the reputation of a good cook.